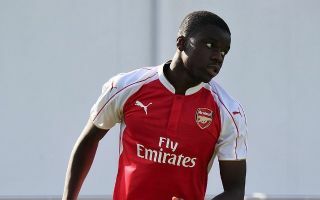 England youth international Stephy Mavididi left Arsenal to join Juventus on Friday. The 20-year-old had been on the Gunners’ books since he was a child, but never made a first-team appearance for the club. Despite his lack of chances at the Emirates, Mavididi sent a pleasant message to his former club as he posed for his first Instagram photo as a Juve player. Captioning a snap of himself giving a thumbs up at Juve’s training ground, Mavididi wrote: “Thanks @arsenal for the past 8 years. “Now onto a new challenge new chapter & a new home. Delighted to commit my future with @juventus club. “Big thanks also to the @crownfootball family. #TunnelVision #TheOldLady’. Mavididi will initially jothe Juventus B team, according to Sky Sports.